Washington, DC – The Pentagon’s Joint Chiefs of Staff (JCS) have been indirectly providing intelligence on the Islamic State to the government of Syrian President Bashar Assad, in direct contrast to the Obama administration’s agenda of regime change, in an effort to stop Syria from becoming another failed state from which terrorists can operate. A recent investigation by renowned journalist Seymour Hersh provides clear evidence of a massive disconnect between President Obama’s White House and the U.S. military regarding the handling of the Syrian situation. The awkward situation stems from the Obama administration’s insistence that there are “moderate rebel” groups to arm that are capable of defeating Assad, and the subsequent decision to provide weapons to these jihadist groups through a covert CIA program. In spite of the “Assad must go” pledge made by President Obama and covert CIA program, the U.S. JCS instead opted to feed intelligence on the Islamic State to the Syrian government through a number of intermediary governments, the unidentified former senior advisor to the JCS told Hersh. “Our policy of arming the opposition to Assad was unsuccessful and actually having a negative impact,” the former JCS adviser told Hersh. “The Joint Chiefs believed that Assad should not be replaced by fundamentalists. The administration’s policy was contradictory. They wanted Assad to go but the opposition was dominated by extremists. So who was going to replace him? To say Assad’s got to go is fine, but if you follow that through – therefore anyone is better. It’s the “anybody else is better” issue that the JCS had with Obama’s policy,” the unnamed JCS advisor said. The Joint Chiefs felt that a direct challenge to Obama’s policy would have ‘had a zero chance of success’. So in the autumn of 2013 they decided to take steps against the extremists without going through political channels, by providing US intelligence to the militaries of other nations, on the understanding that it would be passed on to the Syrian army and used against the common enemy, Jabhat al-Nusra and Islamic State. 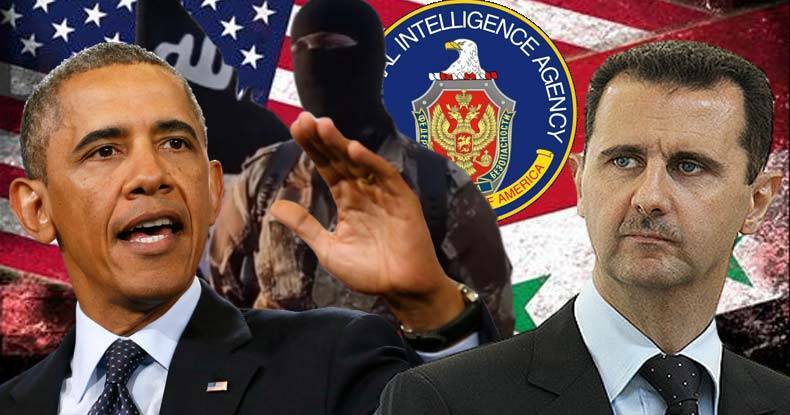 The impetus behind the military’s action was a highly classified Defense Intelligence Agency (DIA) report, which made clear that if Assad were to be deposed, Syria would fall into chaos and provide an easy target for Islamic extremists to gain a strong foothold similar to Libya. A former senior adviser to the Joint Chiefs told me that the document was an ‘all-source’ appraisal, drawing on information from signals, satellite and human intelligence, and took a dim view of the Obama administration’s insistence on continuing to finance and arm the so-called moderate rebel groups. By then, the CIA had been conspiring for more than a year with allies in the UK, Saudi Arabia and Qatar to ship guns and goods – to be used for the overthrow of Assad – from Libya, via Turkey, into Syria. The new intelligence estimate singled out Turkey as a major impediment to Obama’s Syria policy. The document showed, the adviser said, ‘that what was started as a covert US programme to arm and support the moderate rebels fighting Assad had been co-opted by Turkey, and had morphed into an across-the-board technical, arms and logistical programme for all of the opposition, including Jabhat al-Nusra and Islamic State. The so-called moderates had evaporated and the Free Syrian Army was a rump group stationed at an airbase in Turkey.’ The assessment was bleak: there was no viable ‘moderate’ opposition to Assad, and the US was arming extremists. The reality created by the CIA program to arm the “moderate rebels” is harrowing, as arms were handed to virtually any group opposing Assad’s military, including terrorist organizations such as Jabhat al-Nusra and the Islamic State. In stark contrast to the White House and CIA, the U.S. military’s assessment was extremely realistic: moderate opposition to Assad is a complete myth and the U.S. was arming the same Islamic extremists it had just got done fighting in both Afghanistan and Iraq.